Contrary to popular belief, pork is a surprisingly healthy protein choice as compared to many cuts of beef. It is no higher in calories than chicken or beef, and lower in the saturated fats that make steak something to be enjoyed only occasionally. A 3-pound pork roast is a simple cooking task, and one that will provide enough meat for a family to enjoy as a meal and for leftovers in the coming week. Place your oven rack in the center and preheat to 450 degrees Fahrenheit. Set the pork roast on the baking sheet, fat side up. Cut your pork roast in half, if necessary, to fit. Pour 1 tablespoon of oil into the small cup. Combine rosemary, sage, thyme and oregano to taste so that you have a total of 1 tbsp. of mixed spices. Mix with 1/2 teaspoon each of salt and ground pepper. Add the mixture to the oil. 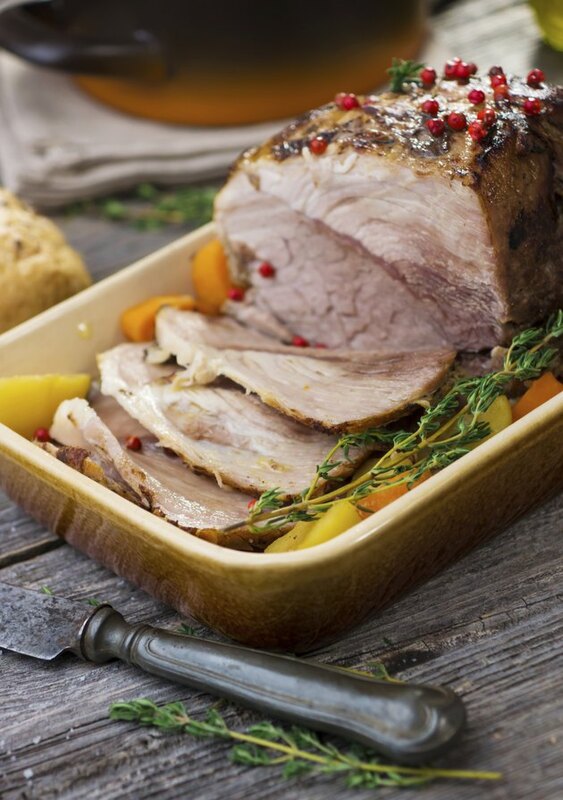 Rub the spice mix on the pork roast to thoroughly coat its top, bottom, sides and end. Return to the roasting pan, fat side up. Roast the meat in the oven for 10 minutes. Reduce temperature to 250 Fahrenheit and continue to cook until the internal temperature reaches 150 degrees Fahrenheit. This should take about one hour for a 3-pound roast. Remove the roast from your oven and allow to rest for 15 minutes.